Step aboard and go back in time with your lover this Valentine&apos;s Day. Dean Ogan, owner of Rocky Top Hospitality announced that The Daily Planet Café will host a luxurious Valentine’s Day dinner on Feb. 14. “Star-Crossed Lovers: Love Stories from the Titanic" is a special Valentine&apos;s Day dinner inspired by the Titanic: The Artifact Exhibition temporary exhibit at the N.C. Museum of Natural Sciences. Bring your special someone to The Daily Planet Café to enjoy what might have been the last meal served on the famed ocean liner. The Daily Planet Café will recreate the Titanic&apos;s first-class passenger dining room so guests can go back in time. 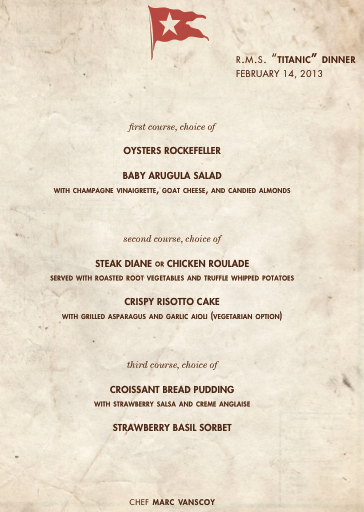 This special Valentine&apos;s Day dinner will begin at 6pm with a cocktail hour of Titanic-inspired drinks. Try the “Iceberg Martini,” “Night Sky” or the “St. Germaine & Champagne.” The three-course dinner follows cocktail hour and highlights a variety of dishes inspired by cuisine that would have been served onboard the Titanic. Star-crossed lovers will dine as they also enjoy performances featuring love story narratives that emerged on the ship. Tickets to the "Star-Crossed Lovers: Love Stories from the Titanic" are priced at $50 per person and include a pass to see “Titanic: The Artifact Exhibition” that can be used at a later date. Specialty cocktails will not be included in the ticket price. Purchase your tickets today to ensure a romantic evening that your lover will never forget.